The agreement was signed on Thursday at the UK’s Foreign and Commonwealth Office in London by ambassador Beryl Samson and George Hollingbery, the UK’s Minister of State for Trade Policy. (Seychelles News Agency) - Seychelles and the United Kingdom have signed an Economic Partnership Agreement to reflect continuity of the trade relationship between the two countries in view of the envisaged exit of the UK from the European Union. 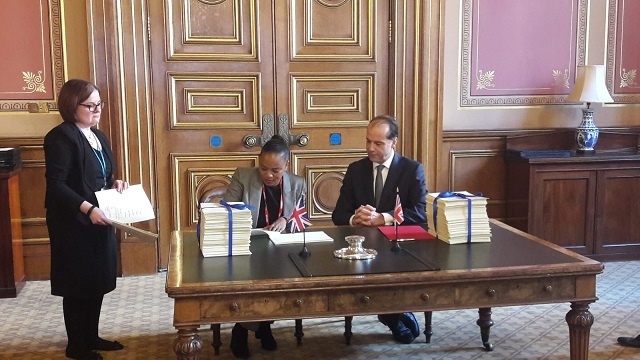 The agreement was signed on Thursday at the UK’s Foreign and Commonwealth Office in London by Beryl Samson, Seychelles’ ambassador to Belgium, and George Hollingbery, the UK’s Minister of State for Trade Policy. In a recent interview with the press, Cillia Mangroo, the principal secretary of trade and investment, said that in view of the current situation, it was important for Seychelles to be cautious and to sign and ratify this new agreement with the UK before March 29 this year, the date on which the UK has to leave the EU. Mangroo said that in the case that there is a no Brexit deal, the UK will not have a transition period with the EU and this will be a concern for Seychelles as it will not have preferential access to the UK market. “This will be a huge loss of revenue for Seychelles thus the importance of having the agreement before March 29,” said Mangroo. The UK is where almost 30 percent of the tuna exports of the Indian Ocean Tuna (IOT) company based in Seychelles to the EU are geared. Exports from Seychelles, an archipelago in the western Indian Ocean, to the EU are currently granted duty-free quota-free treatment upon entry into the European market, due to the interim Economic Partnership Agreement (IEPA). The IEPA was signed in 2009 and entered into force in 2012. Negotiations to have this new agreement started in September 2017 following the UK’s decision in June 2016 to move out of the European Union through a referendum which began negotiations for a Brexit deal. This process led the UK to invoke Article 50 of the European Treaty on March 29, 2017. “Following this, Seychelles together with other Eastern and Southern Africa (ESA) countries initiated negotiations to move the current agreement they have with the EU into one directly with the UK,” Mangroo said. Along with the preferential market access in the EU market, the EU imports into Seychelles are also granted preferential access over a phase-down period lasting to 2022, whilst duties on a list of products of national interest were maintained indefinitely. It is expected that this agreement will be tabled to the Seychelles’ National Assembly for ratification upon its return from recess.